This is part 1 of a 2 part series. For part 2, please click here. Why do we need this at PassKit? To display a ‘live’ pass-render with accurate barcode in our Pass Designer & Management Tools. To generate QR codes (at scale) for our merchants for printing their Loyalty-program enrolment links onto tent-cards, menu’s, websites, Facebook pages, etc. Speed! Very fast & a perfect choice for CPU-intensive tasks. Quick & easy to master in a very short amount of time. Compiled binariers: plays nice with Docker. Well defined error handling patterns. Standard code formatting / ease of maintenance. 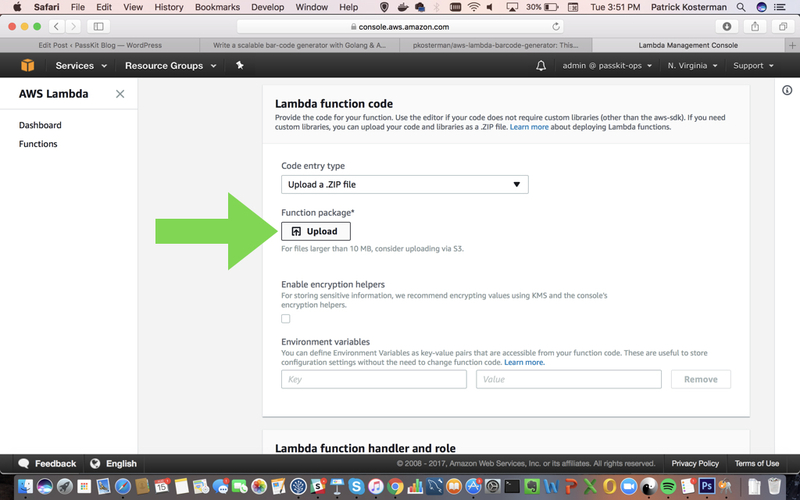 AWS Lambda is a cloud computing service that lets you run code without provisioning or managing servers. 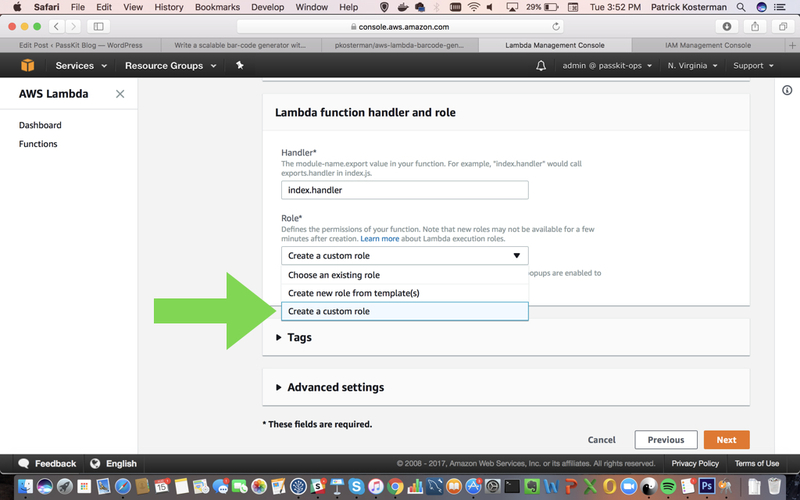 AWS Lambda executes your code only when needed and scales automatically. In other words, it’s efficient and easy to use at scale, and you only pay for the resources that you use. What else could this logic be applied to? Scalable image generators / manipulators on AWS (although keep in mind that if you’d want to use external image-libraries like Imagick or VIPS – AWS Lambda won’t be your optimal solution). Scalable document generator (PDF, Excel files, etc) on AWS. 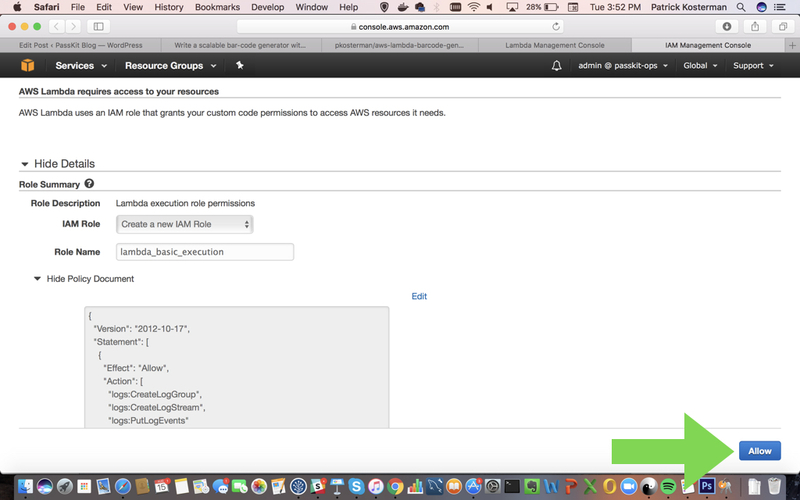 You will need an AWS account with access to Lambda & API Gateway in order to build this. A QR code of 200px by 200px, with the content ‘testing’. A PDF417 code of 200px by 50px, with the content ‘testing’. message: barcode contents, UTF8 support (string). type: barcode type, ‘qr’ or ‘pdf417’ (string). Minimum barcode with & height: 150px. Maximum barcode width & height of: 3000px. Maximum length of barcode contents: 600 bytes. Barcode types that are supported: QR, PDF417. main.go: this contains the actual barcode generation (wrapped in our Node.Js wrapper). lib/nodewrapper/nodewrapper.go: this library marshalls input from/to the stdin & stdout between our Go function and the Node.Js Lambda function. For this article, we will mainly focus on item 1 – the main.go program. If you want to re-use the nodewrapper for another project, you can simply do so by changing the contents of the Handler function, and, renaming the executable file in index.js to the name of your compiled binary. The function uses an existing barcode library for Go, since it’s well maintained, reasonably fast, and works like a charm! For the rest it uses standard Go libraries. All of the fields in the struct are pointers so that the function can return helpful error messages in case if one of them isn’t present (i.e. nil). 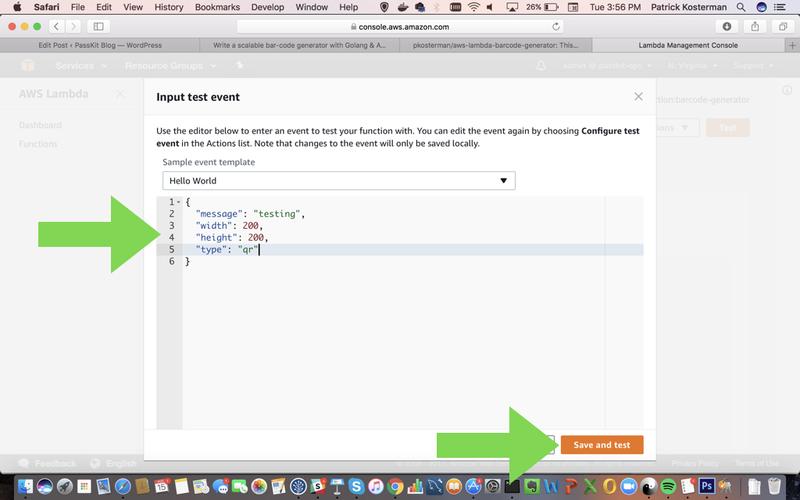 If you were to use this code to perform some different action with a Lambda (let’s say send an SMS message), then this is where you would specify the fields that you expect in your Lambda eventJSON. The function validates the input struct, and then uses the struct to generate a barcode according to the API specification. 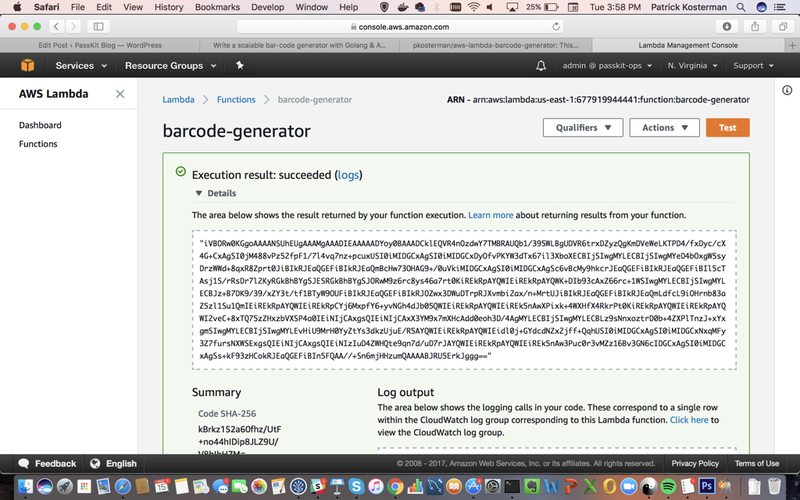 It then returns the barcode as a base64 encoded string, which the Lambda will pass onto API Gateway. You can see from the code that all errors are prefixed with their HTTP status code. 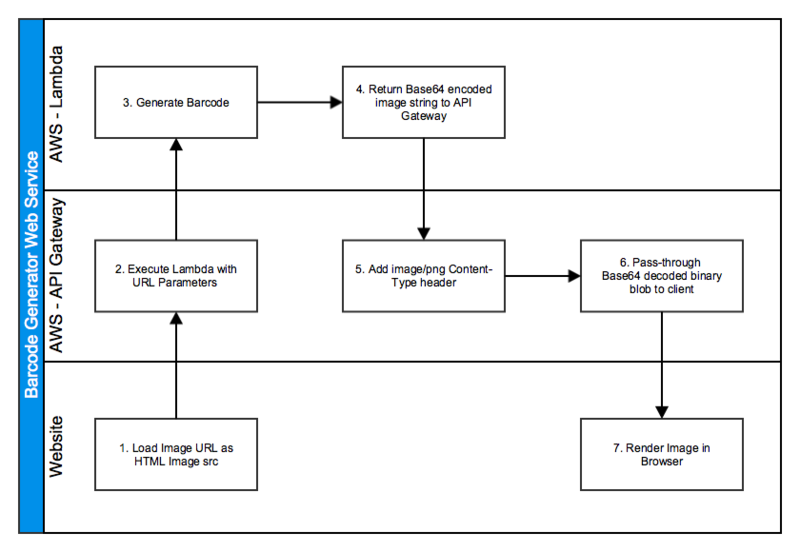 This will later-on make it easy for API Gateway to do the proper HTTP header mapping. Based on the required output (JSON, or raw), the rawOutput boolean can be either true or false. 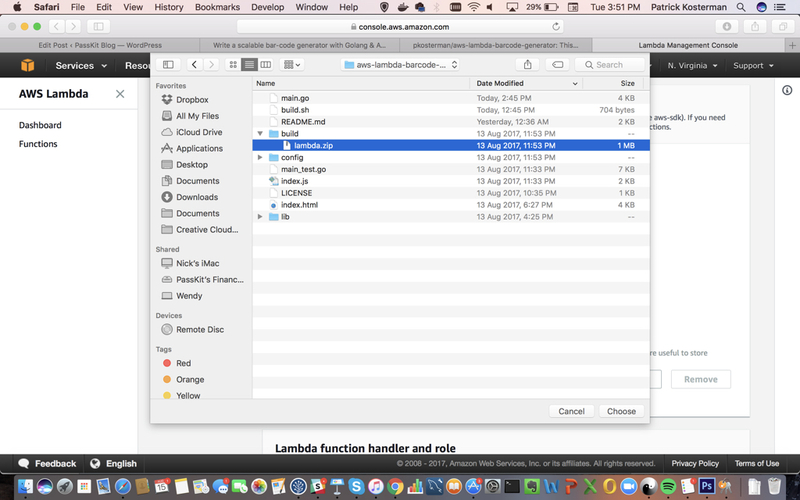 This will create a build folder with in there the lambda.zip file. This zip file contains the compiled Go binary, and the index.js code that executes this binary. 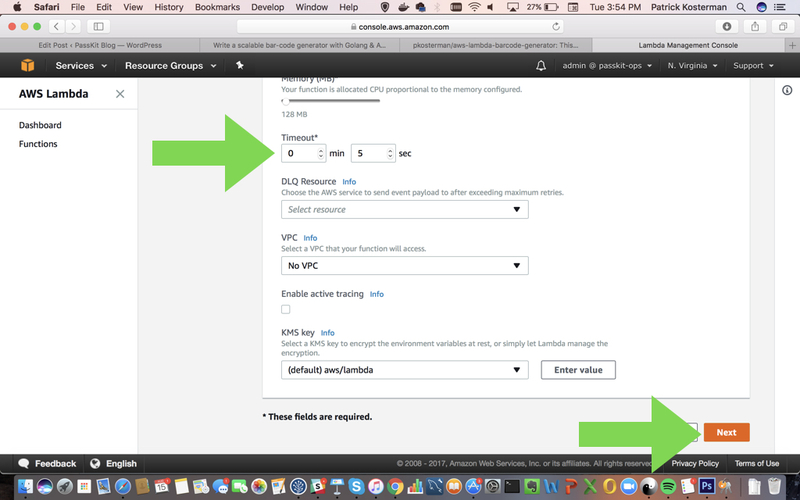 Next, we need to upload the zipped deployment package to AWS. 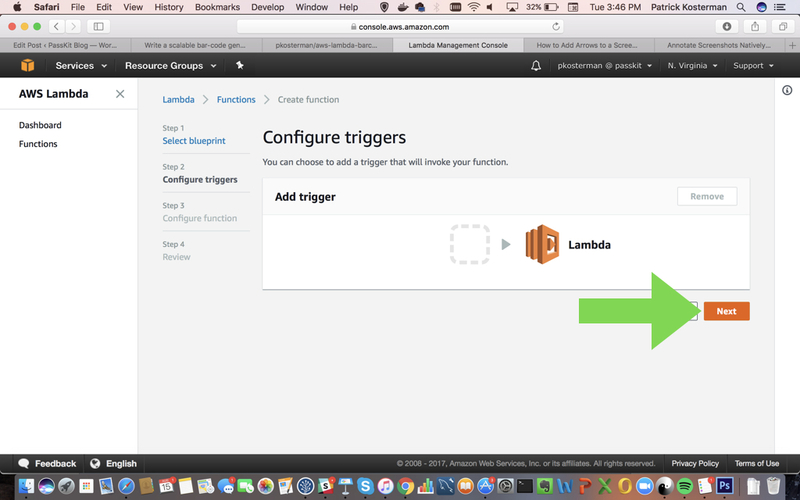 Login to your AWS account, and navigate to Lambda. For the runtime version, we will pick the latest Node.Js version that Lambda supports (which at the time of writing is 6.10). All that is needed for this particular lambda to run is the lambda_basic_execution role. 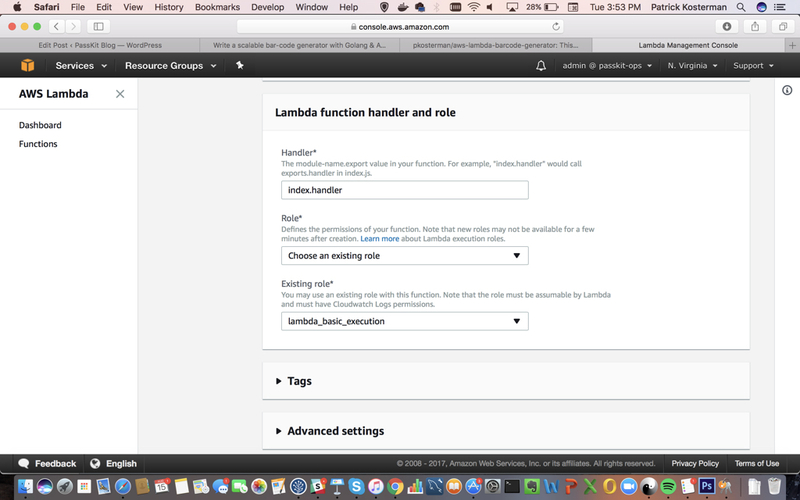 Note: If you plan to write a Lambda that will be accessing other AWS services, then this will not be sufficient enough. In that case you’d have to create a new custom role and add additional permissions for the AWS services that your Lambda will consume. 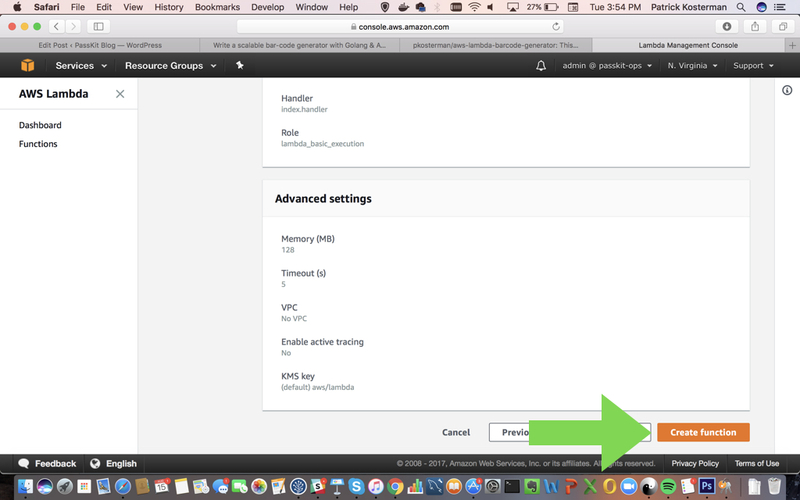 By default an AWS Lambda function times out after 3 seconds. For this particular Lambda we don’t need to increase the timeout, since the Go barcode generation is reasonably fast (~10-20ms). 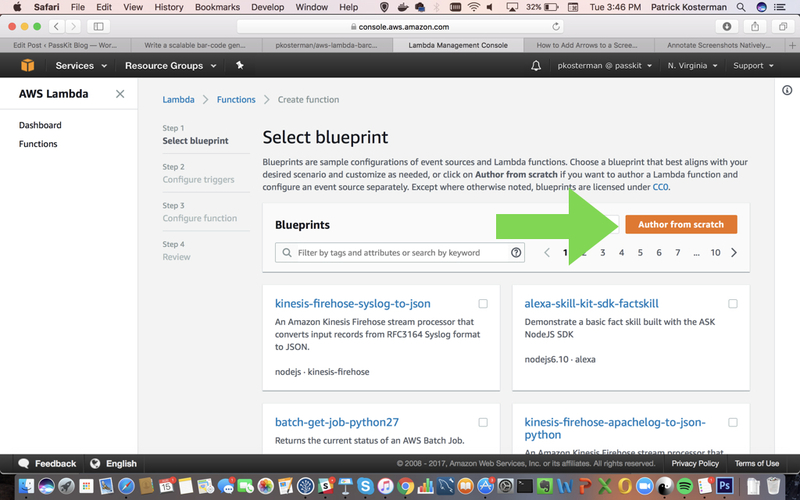 But in case you are writing a more complex Lambda, then you might want to change these settings. 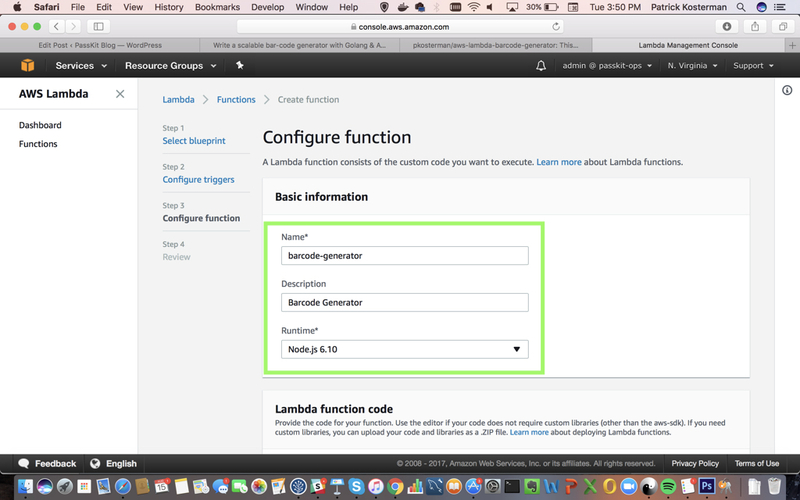 The Lambda function is setup correctly! 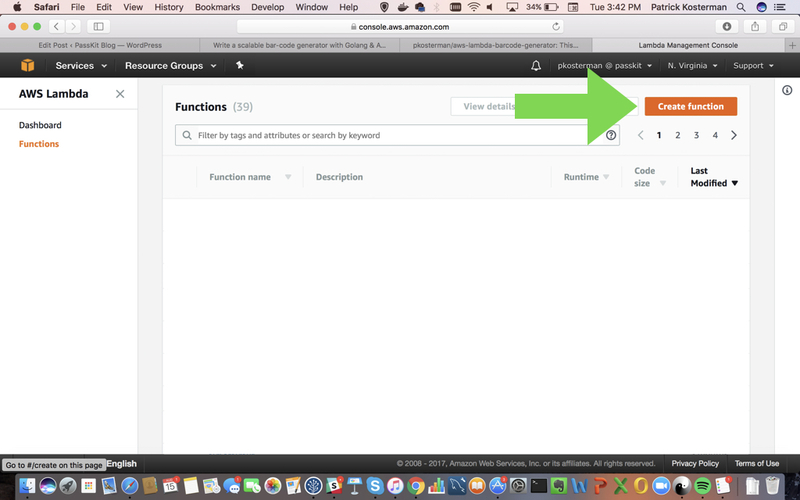 Next, Part 2: learn how-to setup the API endpoint in API Gateway, so that it can call the Lambda via a GET HTTP request. 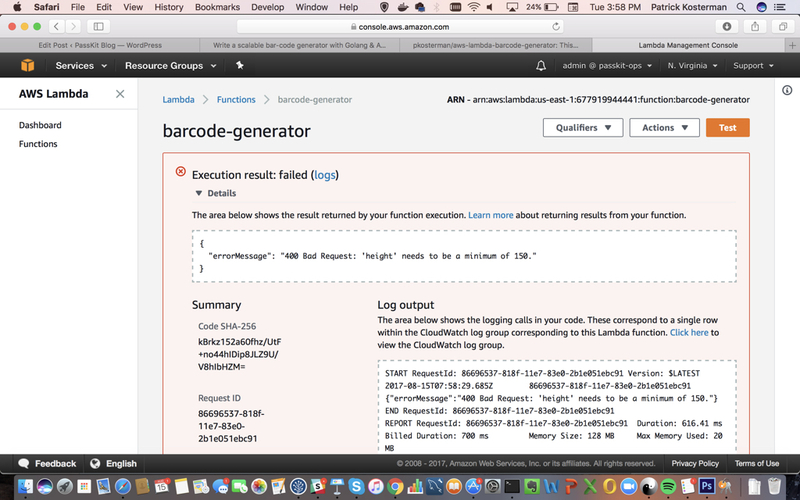 I need some help with adding the Lambda.zip, I have uploaded the https://github.com/pkosterman/aws-lambda-barcode-generator to Lambda, but i’m getting lost on how to import lambda.zip..